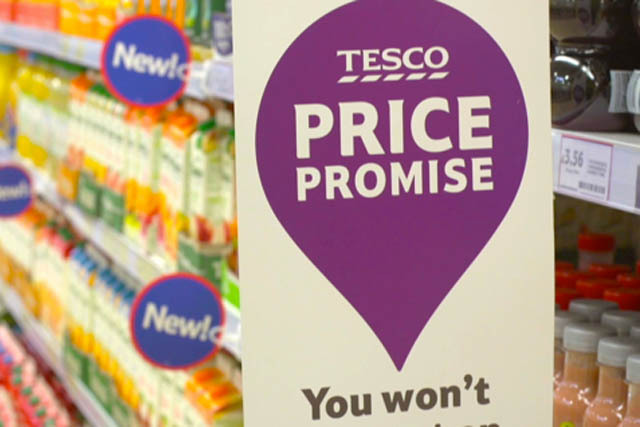 Tesco's Price Promise is under threat, with rivals Sainsbury's and Morrisons seeking to get ads for the price match banned and the ad watchdog launching an investigation into the initiative. The Advertising Standards Authority (ASA) has launched an investigation into a Price Promise ad following a complaint by Sainsbury’s, while Morrisons is gearing up to lodge its own complaint as it accuses Tesco of "not correctly comparing prices" of own-label goods. Sainsbury’s has complained about a regional press ad for Tesco’s Price Promise that ran in Northern Ireland last month and claimed customers "won’t lose out on big brands, own label or fresh food" if they shopped at Tesco. It is understood the ad subsequently appeared in press in the UK mainland, but any ASA investigation is applicable to the ad wherever it appears. However, Sainsbury’s claims the advert is misleading in relation to own-label and fresh food because "important product attributes had not been taken into account". News comes after Sainsbury’s chief executive Justin King questioned "how on earth one truly and fairly compares own label". Meanwhile, Morrisons claims it is preparing to lodge a complaint over after accusing Tesco of being "unable to make a comparison" because, in many cases, Morrisons’ prices are listed as "not available" by Tesco. The unavailable prices may be a result of Tesco only being able to check Morrisons’ prices manually through mystery shoppers, according to Morrisons. Morrisons has written to Tesco’s trading standards specialist to make its rival aware of its concerns and if it is not satisfied with the Tesco response it will lodge a complaint with the ASA. The supermarket is citing research that claims Tesco is using its Price Promise to claim a shop at Tesco is cheaper than shopping at Morrisons, when in actual fact it is more expensive. One shopping trip that included products from the Grocer 33, a shopping basket picked by The Grocer magazine, resulted in the Tesco Price Promise claiming it was cheaper than Morrisons. However, when five products from the shop were included in the calculation, which the Price Promise was not able to compare, it was discovered Tesco was actually £1.05 more expensive. The BBC You and Yours programme also found discrepancies between the cost of Morrisons' products quoted by Tesco’s Price Promise and the actual prices, which resulted in Tesco falsely claiming a basket of products from Morrisons was more expensive than the same items from Tesco. Crawford Davidson, customer director at Morrisons, said: "We are complaining because Tesco’s Price Promise provides a false assurance that it will compensate customers when Morrisons is cheaper, which it mostly is. "Customers expect Tesco to do this properly. If Tesco can’t accurately collect prices of its rivals and make trustworthy comparisons, then it should not be making this so-called promise." A Tesco spokeswoman said: "We use an independent agency to check prices of branded and own label products at other retailers – online daily for Asda and Sainsbury’s, and since they don’t have an online grocery service, twice a week at Morrisons stores. "The basis for our comparisons is made clear on the Price Promise website."